Book a session and experience the power of sound for yourself. Have you ever heard a Tibetan Singing Bowl? Their sounds are enchanting and healing. Their vibrations can be felt throughout your entire body. 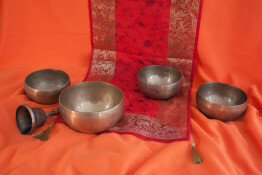 Tibetan singing bowls date back to pre-Buddhist Tibetan Bon culture where they were used in rituals and as a healing, relaxation and meditation practice throughout Eastern culture. 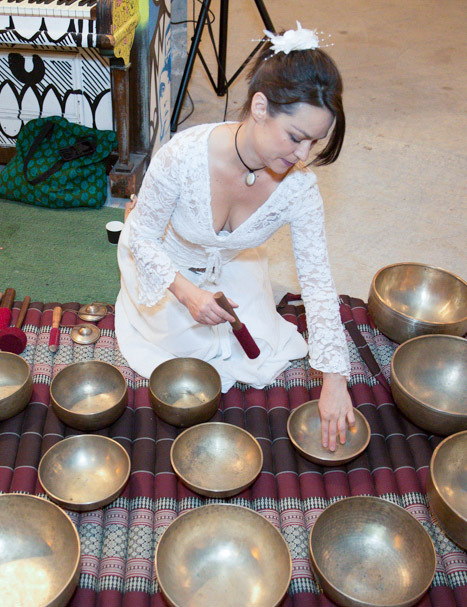 Today they are used in sound healing, music therapy, yoga, and as an aid to reaching meditative states. 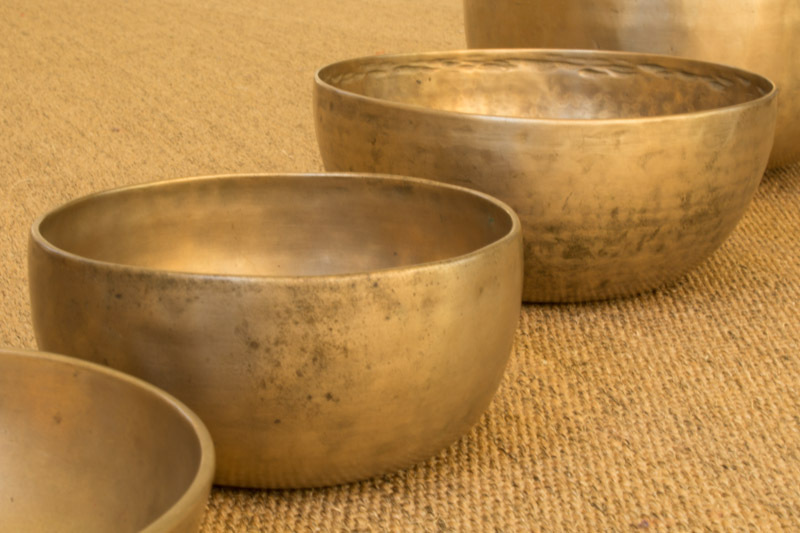 The bowls were specially designed from 7 different metals and in a shape that when struck creates intense vibrations and sounds that induce a state of relaxation and bliss. In modern society, we are suffering from a stress epidemic. Recent scientific research is proving the extraordinary benefits this type of sound and vibration therapy can have on our health and wellbeing. In particular, with iradicating stress, pain, anxiety and insomnia. During the majority of everyday lives, our brainwaves, register as a Beta frequency. 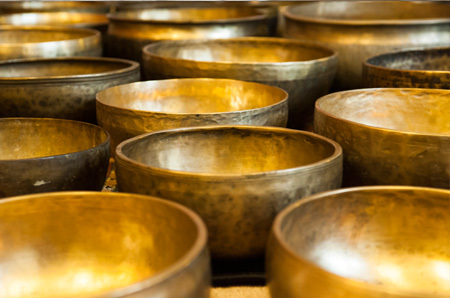 During a Tibetan Bowls session, the sound waves and vibrations penetrate our brain cells, and our brainwaves start to synchronise with the vibrations of the bowls, forcing us into a theta brainwave state. The right and left hemispheres of the brain begin to balance and a similar effect of coherence and synchronisation also occurs within our bodies, harmonising the nervous system and reducing or eliminating pain, stress and anxiety. 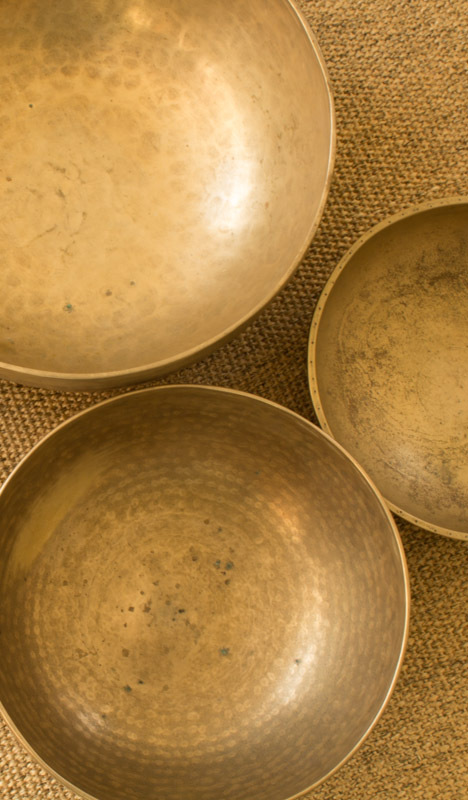 Through clinical observation, it has been seen that vibrational sound therapy can effect stress related conditions, including cardiovascular irregularities or problems, muscle spasms and anxiety. 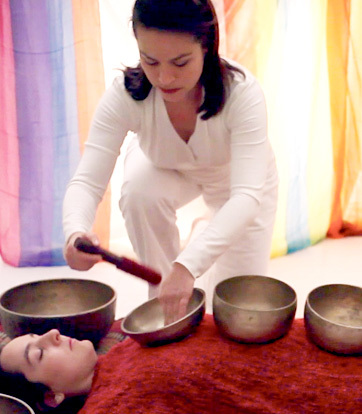 Sound healing can charge your immune system and deepen oxygen flow to internal organs, thereby improving overall health. It can significantly improve our sleeping patterns, reducing chronic fatigue, insomnia and all the medical and psychological disorders that can often accompany sleep deprivation. 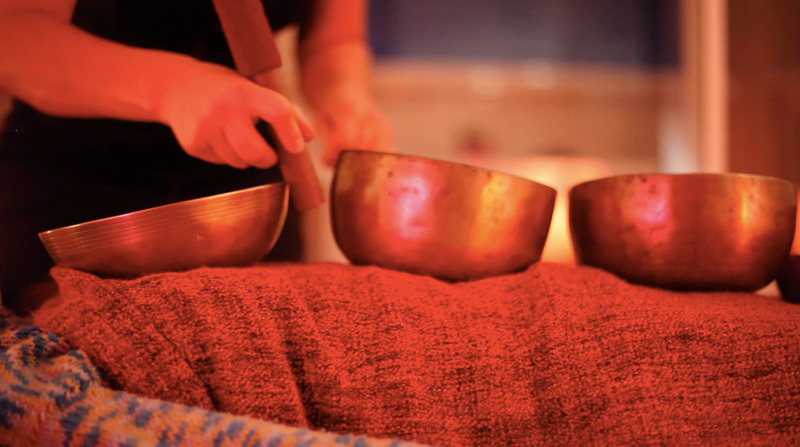 In practice, the massage of sound can create inner harmony, promote overall health and restore balance, leaving the body feeling light, positive and full of energy. It is also great for improving memory and creativity. It is great for anybody who wants to meditate, but finds it difficult to get into a meditative state on their own. 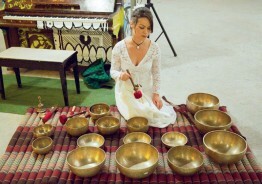 The vibrations of the bowls induce a meditative state, regardless of how busy a person’s mind is. Have troubles relaxing or sleeping? Get your free consultation right now. If you like the samples, come to us for a real trial. Using sound, it is possible to make profound changes in brainwave patterns and states of consciousness, observable on brainwave mapping equipment (EEG), as well as positive changes in the body measurable with blood tests, biofeedback equipment and other sophisticated procedures — Dr. Jeffrey D. Thompson, D.C., B.F.A. Each piece of equipment below has its own unique history and its own sound and vibration. The Ghanta, or “Drilbu” in Tibetan, is a ritual handbell symbolic of ‘male’ and wisdom. Dorje is Tibetan for indestructible diamond scepter, and is symbolic of ‘female’ and compassion. 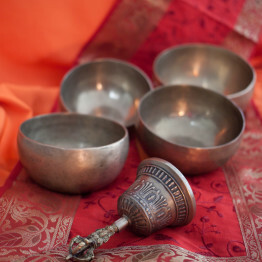 Together, the Ghanta and Dorje symbolize the perfect union of wisdom and compassion necessary to achieve enlightenment. The Ghanta is typically made of five-metal bronze alloy according to an ancient formula. The Dorje is made of brass. 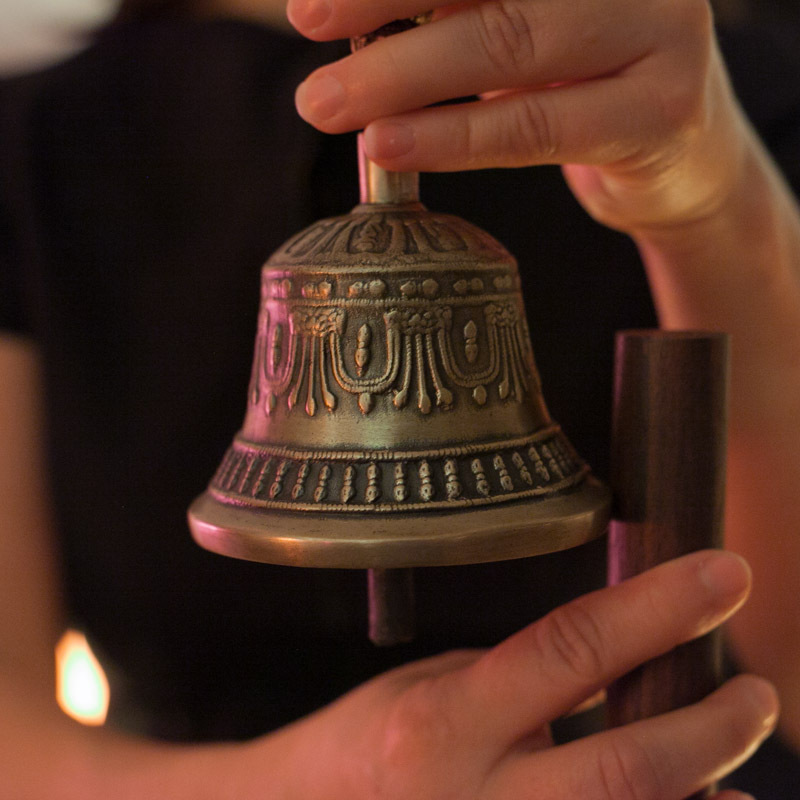 The bell resonates loudly with beautiful harmonic resonant frequency when rubbed with a wooden mallet. The Ghanta can be played by ringing, as each has a clapper suspended inside, or by rubbing around the outside rim with a stick (similar to how the Tibetan singing bowls are played). 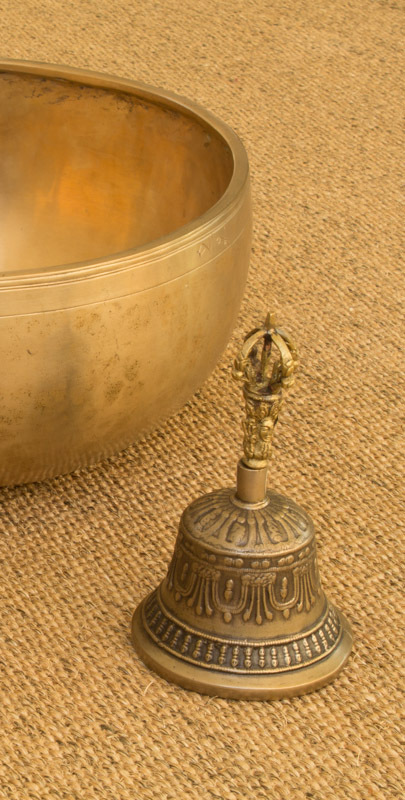 Traditionally the Bell was used in rituals to call the presence of the Budda, before a prayer or to clear the mind of worldly matters and dispel stress and tension. In modern times the bell is more often used for meditation, space clearing, healing or unblocking the chakras. Tingsha have their origin in Bön Shamanism, which predated Buddhism in Tibet. 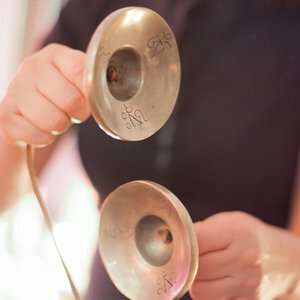 Tingsha are two cymbals, circular, solid and thick, connected by a leather strap or chain. 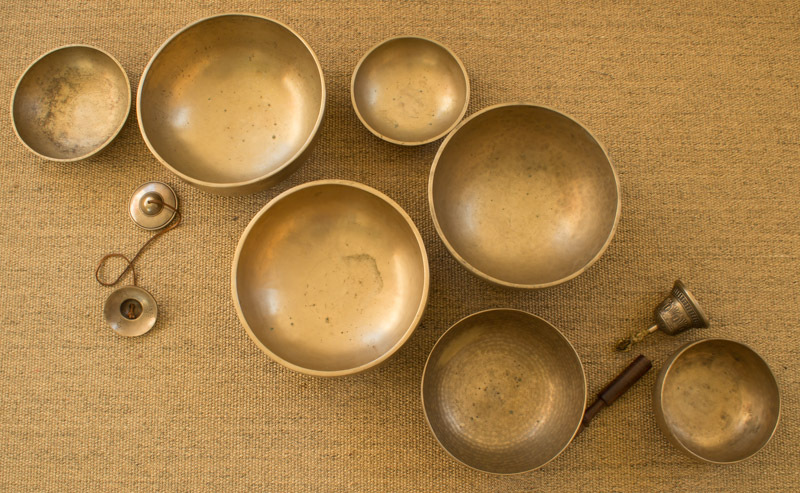 Antique Tingsha were made from special bronze alloys that produce harmonic overtones. Fine quality examples of antiques or the rare pair of carefully matched new Tingsha will sound identical. 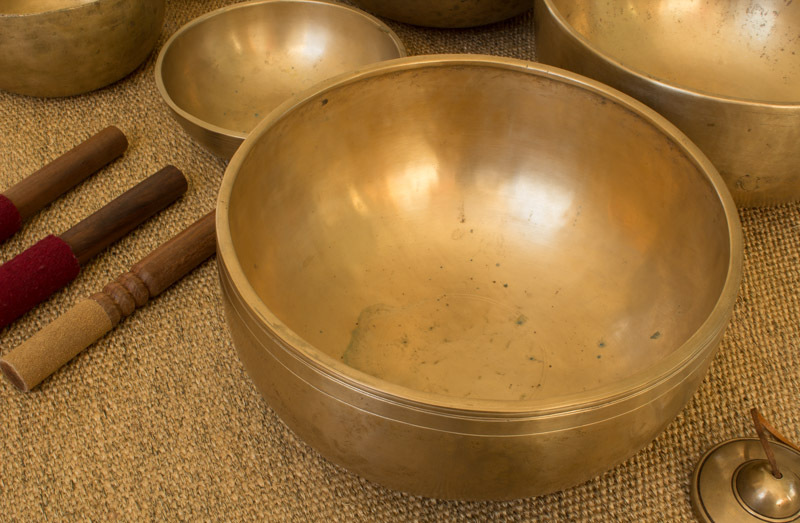 Most Tingsha, however, are not perfectly matched so each produces a distinctly clear and high pitched different tone. 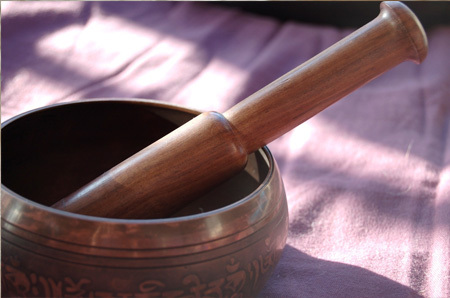 Today, Tingsha are used along with singing bowls and other `ruments in meditation, music and sound healing. The number of sessions required will depend on the what the individual's needs are. An individual session is sufficient for a relaxation experience. A course of 6 sessions is recommendeded for a significant change in insomnia or stress related conditions. 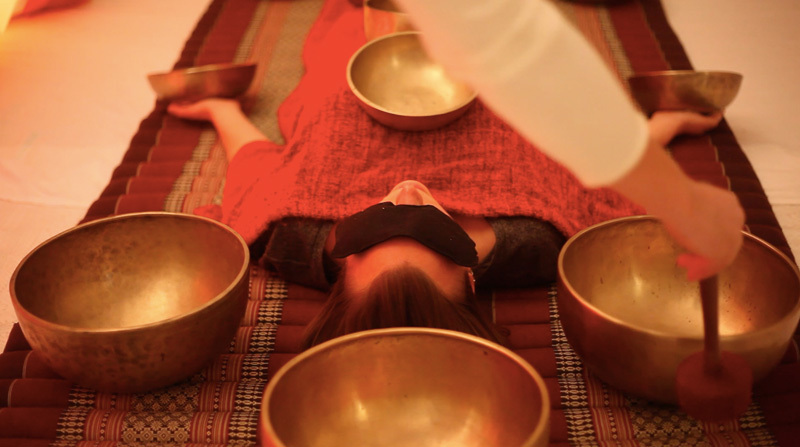 What is different about the sessions at Healing Waves? 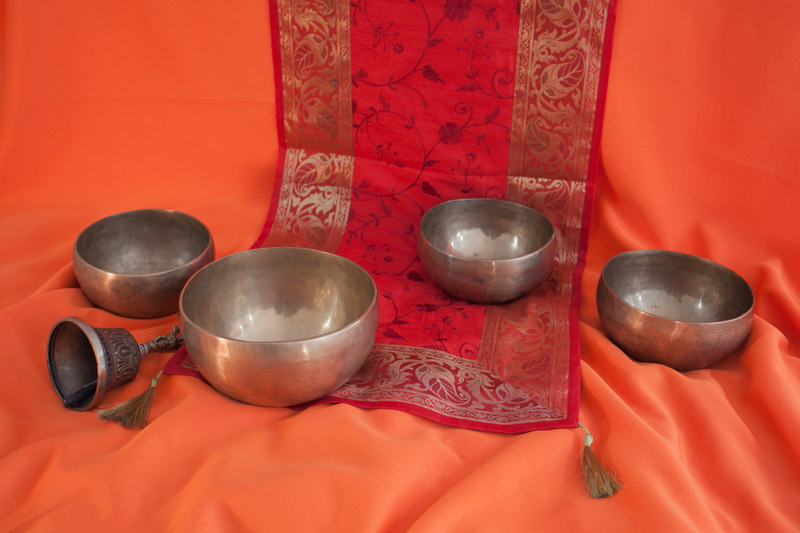 We have the finest quality Singing bowls from Tibet. The bowls used during the session are all hand beaten and are over 115 years old. They originate from the Hor and Jang communities in Tibet. Both of these communities were destroyed by the Chinese and no longer exist. The bowls were made with monks chanting during the creation process. We offer one on one healing sessions. Our practitioner has been trained by Tibetan Singing Bowl experts in both India and the USA. After years in the corporate world, we discovered that stress had significantly affected our minds and bodies. Between us, we were suffering from insomnia, anxiety and various other stress related conditions. We searched for a solution to return our bodies to their natural states. 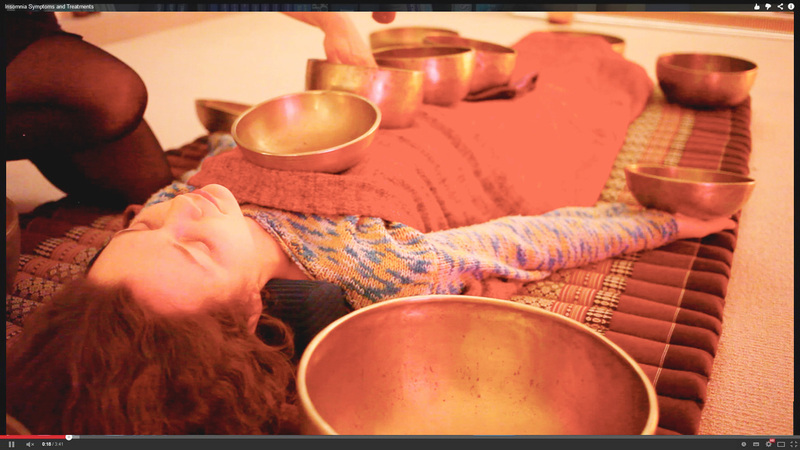 Our journey took us to India, where we studied various ancient healing methods. After extensive studies into different modalities, we discovered the Tibetan Singing Bowls. This was the most powerful and effective technique for inducing a theta brainwave state – the most relaxing and healing state our bodies and minds can reside in, outside of sleep. We became very passionate about this method due to the incredible results it produced within ourselves and others. We travelled to the US to further broaden and deepen our expertise. Our passion grows daily as we witness the transformations in our clients both in Australia and overseas. Sessions last for 45 mins. They can be a single session for a relaxation experience, or a set of sessions for long term help with insomnia, pain, stress, or anxiety. I didn't know what to expect from the session. I experienced an intensely deep sense of relaxation and peace. All of my stress and tension just evaporated. I will definitely be back for more. During the session all of my worries just disappeared. I felt like I was floating. 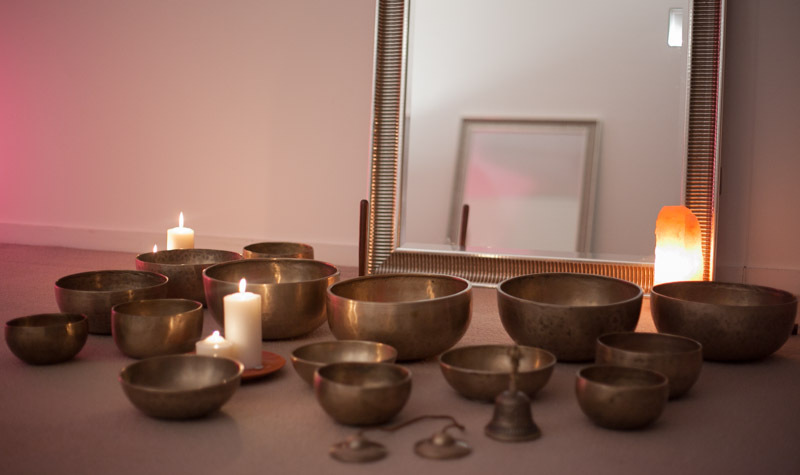 By the end of the session I felt an incredible sense of calmness and clarity. Everything shifted into perspective. What's more I felt serenely blissful. You have to try it to experience it! I typically have a lot of difficulty sleeping. After my session, I had the best night's sleep I have had in a long time. Thank you so much! I have a lot of trouble switching off my mind. As the bowls were played around my head, I couldn't help but relax. It was enchanting. Got a question? Send us a message and your preferred contact method and we will get back to you as soon as possible. You can also use this form to ask for a free trial session. Located in Bondi and Sydney. Contact us for further venue information.